There is was last evening spread out before me to enjoy from my window seat on a moderately comfortable United 757 headed from Baltimore to Denver. It was the horizon and the sunset. I do not normally sit in window seats, so when on those rare occasions that I have to, I try to make the most of the experience. 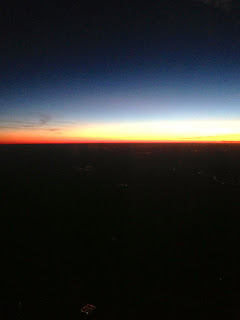 The sunset made the almost four hour flight crammed into a space too small to survive almost worth the adventure. I don't often get to see the full, unobstructed horizon at sunset. Trees and buildings and even hills and mountains often steal part of the scene. I had been watching the sunset develop, rather than taking my usual mid-flight nap. As it became deeper and deeper, I just knew I had to try an image to hold the scene in my mind. I know why painters paint--because deep in their souls they see something that needs to be captured and remembered. Before it had become too dark to make out the details, I had been watching the towns and cities pass beneath the jet. I watched the lights come on as dusk gathered and finally began to notice the patterns of the street lights on the ground trying to stave off the darkness. All too soon, it was dark and I was reminded that darkness is not the opposite of light, but rather the absence of light.